At Knit Nation I picked up a half-kilo of Gotland fleece from Well Manor Farm. I've never worked with sheep's fleece before, and I used to swear I wouldn't. I've worked with alpaca fleece and loved it, but sheep fleece has a couple major differences from alpaca: first, sheep are generally dirtier animals than alpacas are. 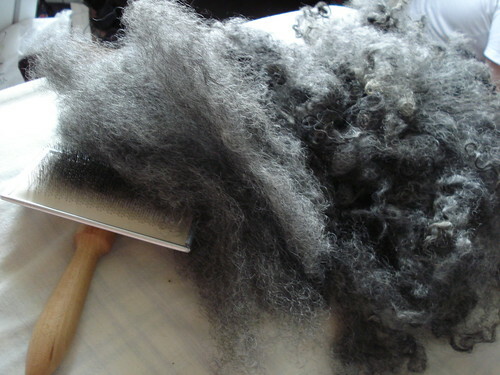 An alpaca fleece may be dusty, and have a little bit of veggie matter in it, but sheep fleeces contain all sorts of muck. Secondly, sheep's fleece has lanolin, a grease that lubricates the wool and keeps it from felting on the sheep. You may be familiar with lanolin from skincare products, as it is beneficial for the skin. But, it also gets everywhere else and, if you leave a sheep fleece for too long, the lanolin will begin to harden and the fleece will be unusable unless you can soften it again. 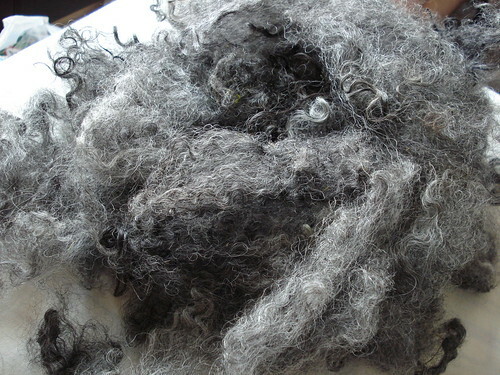 Some fleece is spun 'in the grease', but most of the time a sheep's fleece will need to be scoured, washed of all its lanolin before you work with it. Keep in mind this is only 500g of fleece. A full fleece would be about 3kg! The unwashed fleece is dirty and greasy, with some short-clipped noil bits and some veggie matter. 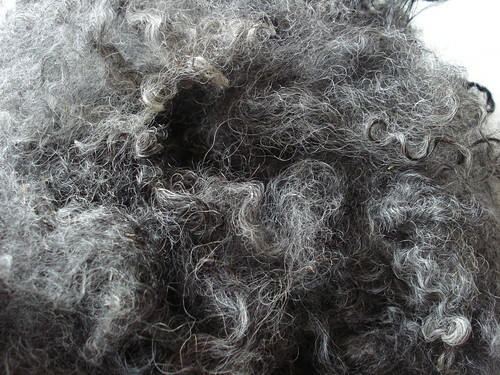 I sorted my fleece by color - there's some lovely color variation in it, from dark almost-black to light silver gray. I'm particularly partial to the lighter shades; it has an almost ethereal quality to it. Did you know that the cloaks in the Lord of the Rings movies were made from a variety of Gotland wool? Washing the locks brought out their true colors. I didn't completely degrease them, just gave them a few rinses in hot-from-the-tap water. All the dirt and dust was removed, but it still has some lanolin. Then, I started to prep the fleece with my hand carders into rolags. From there, I can start to spin.